Sifton praises the sweet cake he adapted from a Massachusetts restaurant as "a corn bread to become a child’s favorite, to become the only corn bread that matters. All else is not corn bread." Food fight ON! Commenters chastised Sifton for including sugar and flour, baking too long at too low a temperature, adding corn kernels, not adding cheese and jalapeños, using too little oil in the pan, using no bacon fat, and choosing a non-traditional two-word spelling—"corn bread" instead of "cornbread." The only faint praise from people identifying as southerners or southern food authorities: Sifton advises using a cast iron skillet—although commenters griped that the enamel-lined skilled in the story's main photo appears to have a wood handle, which could not withstand the high heat required for cooking traditional southern cornbread. The voices of people who favor sweet cornbread seem brave among the bluster. Good for them, standing up for their own food tradition. Regular Savoring Kentucky readers know cornbread's special status and in my week. My Best Man and I host a weekly Monday night Cornbread Supper, a community potluck with a cornbread anchor. I make cornbreads or corn-somethings every week. Guests bring whatever they like: main and side dishes, other breads and cornbreads, desserts and drinks. Cornbread Suppers just turned three, which means I have made cornbread on quite a few consecutive Mondays. Most weeks, I make a traditional Kentucky Black Skillet/Hot Water style cornbread. If I use bacon fat, I also make a vegetarian version. Sometimes I make cornbread that includes sugar, wheat flour or gluten free flours, butter or oil instead of bacon or pork fat. In addition to crunchy non-sweet cornbreads, I've made wonderful sweet corn muffins, and a variety of cakes that include corn or cornmeal, including the delicious Lemon Polenta Cake in the photo above. I've come to think of northern cornbread and southern cornbread as both essential, both scrumptious, each deserving a place at my table. I laughed, though, at the artful ways the Sifton article's commenters expressed outrage about a corn bread recipe, or about each other. The level of righteous indignation reminded me of doctrinal fights over religion. 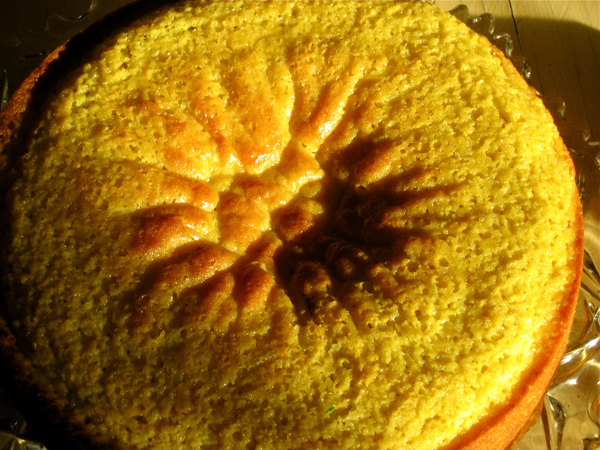 To me, cornbread cannot approach religious doctrine because it is intrinsically forgiving. Add a little more buttermilk or a little less? Sure. Sweet milk instead of buttermilk? Give it a try but leave out the soda. Use an egg or not? Whatever. Seems a little thick? Pour in boiling water. Just get it together and into a well-oiled super-hot cast iron skillet, and all will be well. I think the people who came up with cornbread as a daily staple grew all the ingredients except the leavening and salt on small farms in Appalachia and the mid-south. Today, cornbread remains economic in every sense: affordable, easily produced in about half an hour, and delicious whether hot and crisp, crumbled into a glass of buttermilk, or split and toasted with a little butter. It is especially good slathered with sorghum syrup mixed with butter. Sweet cornbread? I don't know its origins. Perhaps cooks simply wanted something delightful, lightly sweet, and a bit crunchy. In any case, the taste of corn beguiles us, regardless of position north or south of an arbitrary boundary. I like the Cornbread Conversation now underway nationally. I consider it part of the thrilling expansion of national cuisine that now includes elemental Appalachian and southern dishes. The Times itself, as one commenter noted, keeps an eye on cornbread. In 1989, as part of her beautifully written tribute to the food and food ways of the Low Country of coastal South Carolina, Nancy Harmon Jenkins included a recipe for The Best Cornbread. So: "The Corn Bread Matters Most" vs. "The Best Cornbread." Hmmmmm. I'm not seeing any way both the Kentucky universities competing in the men's basketball Final Four can end up happy. But in the Cornbread Battle, I do believe both sides could agree to live and let live. As a precedent, think of the dozens of styles of great barbecue, biscuits, or mustards. Why insist on only one, pure recipe? Eat it all, enjoy it all. Toward that end, the April 2 Cornbread Supper will feature cornbreads cooked with the sweetened Sam Sifton recipe and the non-sweet "Best" Low Country recipe. 6 PM EDT, 250 Campsie Place, Lexington, Kentucky. You're invited. We will not, however, serve either sweet or unsweet tea. One cultural icon at a time.